That's right, out legendary 9c Print offer is back! From October 15th to November 3rd, get 4x6" or 4x5.3" prints for just 9c each, no minimum or maximum quantity, just bring them in on memory card or USB stick and we can print them. 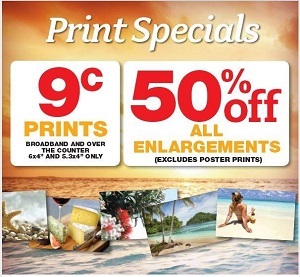 Also running until November 3rd, we have 50% Off the RRP of enlargements up to 12x18" from the kiosk.